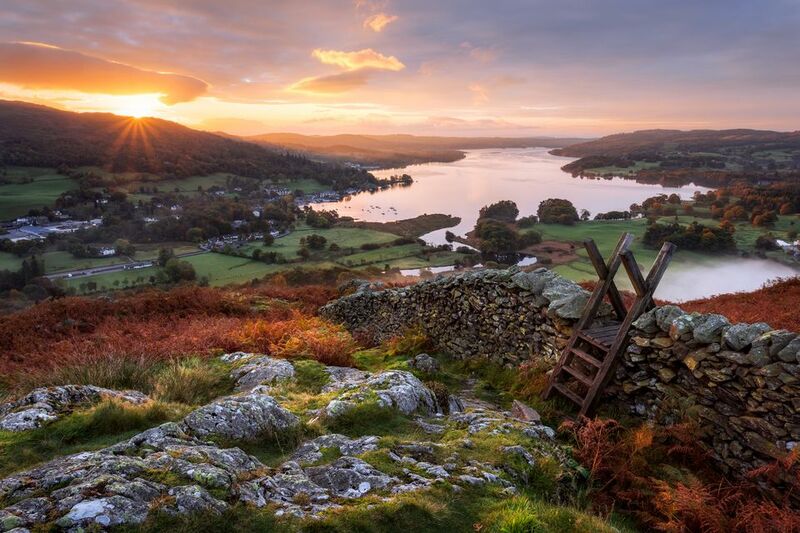 The Lake District, in England's Northwest, is a vast national park, carved out by glaciers about 15,000 years ago; at 885 square miles, it's almost as big as Rhode Island. It has been a center of tourism for about 300 years, making it one of the oldest and earliest vacation destinations in the world. If you remember Wordsworth's poem about Daffodils from grade school - "I wandered lonely as a cloud..." you know the one - then you've already imagined a Lakeland landscape. Did you fall in love with Beatrix Potter's "Tales of Peter Rabbit" and her cast of animal characters - Jemima Puddle-Duck, Mrs. Tiggy-winkle, Squirrel Nutkin, Benjamin Bunny? Then you've entered into the world of the English Lakes. But these gentle landscapes are only part of the Lake District's appeal. It is also England's only true mountain region, with stark, high peaks, challenging mountain passes, deep, dark changeable waters, famous mountain walks and glorious mountain views. The area has four mountains higher than 3,000 feet, including England's highest, Scafell Pike. The pike, at nearly 3,209 feet is considered one of the hardest of the UK's high peaks to actually reach. Its 50 lakes and tarns (small, high lakes surrounded by mountain cirques) include England's biggest and deepest. Windermere, the Victorian playground, is England's biggest natural lake is 10.56 miles long, a mile wide and about 220 feet deep. Wastwater, England's deepest lake is often described as awe-inspiring. It has a surface 200 feet above sea level and a bottom 50 feet below sea level. The lake's most impressive feature, however, are the gravel slopes along one side known as The Screes. They rise from the floor of the lake to an often snowcapped height above the surface of almost 2,000 feet. In the late 17th century, intrepid lady diarest Celia Fiennes rode side-saddle through every county in England, visited the lakes and wrote about them. In 1698 she described the area around the key Lake District town of Kendall as being, "very Rich good Land Enclosed-Little round green hills flourishing wth Corn and grass as green and fresh.." Her contemporary, Daniel Defoe, was less impressed. He visited in the early 1700s and called it the area "the wildest, most barren and frightful of any that I have passed over in England". Times change and tastes change. By the end of the 18th century, revolutions and upheavals in Europe meant that wealthy British and North American colonial travelers were far less interested in doing the traditional Grand Tour of European capitals. At the same time, poets like Wordsworth, Southey and Coleridge were arousing people's curiosity about the beauty of the lakes. The first guide book was written in 1778 and by the time Wordsworth wrote his own guidebook in 1820, the Victorians and the wealthy industrialists of Manchester were summering in the clean, fresh air of the lakes. In 1847, the railways reached Lake Windermere and several other Lakeland destinations. In no time at all, daytrippers from Manchester, Liverpool and Newcastle were flooding in. Windermere was the first of the lakes developed for tourism and even today remains the most popular and the easiest to visit. Kendal: The Lake District National Park and the Yorkshire Dales National Park sit beside each other on the map like a pair of green lungs. Kendal is between them - at about where the sternum would be - just outside both parks. It is large and lively market town with very good modern shopping in at least a dozen small shopping centers and colorful, twice-weekly outdoor markets (every Wednesday and Saturday in the market place) and a daily indoor market (every Monday to Saturday), upstairs in the Westmoreland Shopping Center. There's also a monthly farmer's market that fills the town with market stalls on the last Friday of every month. If you decide to base yourself in Kendal, there's a good choice of hotels and restaurants and a rolling schedule of festivals, events and family activties. While you are there, pick up some Kendal Mint Cake, the town's famous high energy sweet, known to mountaineers and fans of the great outdoors the world over. Penrith - This town, in the Eden Valley, just outside the National Park to the Northeast, is known for the ruins of its massive castle, built in the 14th century by the Neville family. Several centuries later, Ann Neville married Richard, Duke of Gloucester who turned Penrith Castle into his luxury residence in the North. His reign as king was shortlived; he was the infamous Yorkist king, Richard III. Not far away you can visit two neolithic henges, Mayburgh Henge and King Arthur's Round Table, both in the care of English Heritage. Carlisle - A small city north of the National Park, Carlisle is the county seat of Cumbria and the western end of Hadrian's Wall, Its 12th century castle, built by William the Conqueror's son, William Rufus has guarded the boundary between Scotland and England for more than 900 years. The city also has a spectacular 12th century cathedral and the remains of a military citadel built by Henry VIII. Within the Lake District National Park, Keswick (pronounced Kezzik) at the head of Derwentwater, and Windermere, are the largest towns with good facilities for shopping, tourist information and accommodations. Fell walking is, by far, the most popular - and probably the most strenuous and challenging- activity in the Lake District. Sounds, from its name, like a pretty gentle pastime. doesn't it. Don't be fooled. The word fell comes from the Old Norse word fjall for mountain - probably brought over by the Vikings or the Danes. And while some fell walks are modest uphill hikes of a couple of hundred feet, many are long and difficult scrambles up fields of scree or along mountain ridges. But, because the Lakeland fells are virtually bare and preside over vast, U-shaped valleys, the rewards of attempting the toughest fell walks are spectacular views. Even though the English lakes have been visited by tourists for more than 300 years, the popularity of fell walking is a relatively new phenomenon. And it's all down to Alfred Wainwright, a Lancashire accountant and civil servant with a taste for long country walks. Between 1952 and 1966, Wainwright, considered by many to be the father of fell walking, set out to walk all 214 Lake District Peaks and write about them in seven, carefully handwritten and illustrated walking guides. These books have now become British classics. In the summer of 2007, to mark the centenery of Wainwright's birth, six million people watched the BBC2 Series Wainwright Walks. Walking in Wainwright's footsteps opens up some of the best routes and views in the Lakes. The best way to find top views is to get your hands on a volume of Wainwright's Pictorial Guides to the Lakeland Fells or a book of transcriptions of his podcasts, Eight Lakeland Walks. You can probably find leaflets based on the Wainwright walks at the National Park Information Centers. Find a list of them here. Fishing - The rivers and lakes of this area are stocked with brown trout, salmon and sea trout. As with most parts of UK, fishing rights and fishing licenses are controlled by various local fishing and angling associations. There's a list of useful organizations, including several angling associations, on the fishing page of the National Park website. Or ask at your accommodations about organizing fishing in their area. Many will arrange fishing guides for you during salmon season. Unusually for the UK, where almost all fishing and angling is tightly controlled by landowners and various other authorities, you can fish for free in Windermere, Ullswater and Coniston Water. But you will need a rod fishing licence, issued by the Environment Agency for one day, eight days or a year. You can buy a rod fishing licence online here. Swimming - Outdoor, freshwater swimming, called wild swimming in the UK, is permitted in all the lakes except Ennerdale Water, Haweswater and Thirlmere.. Keep in mind, though, that the water is very cold and, even in hot summer weather, some swimmers prefer to wear wet suites. Also, some lakes, such as Windermere and Derwentwater, can have a lot of competing boat traffic. The safest swimming is in the quieter lakes: Bassenthwaite, Buttermere, Crummock Water, Grasmere, Loweswater, Rydal Water and Wast Water. Boating - Canoeing, rafting, kayaking, rowing and motor boating are all popular on the lakes with adventures ranging from guided tours and lessons for beginners to straightforward boat hires for more experienced visitors. Boat hires, guided tours and lessons can be arranged at the National Park centers at Brockhole and Coniston. Hawk 20 sailing dinghies are also available for experienced sailors at Coniston. Cycling - Easy cycleways, quiet lanes and adventurous mountain bike trails are laced through the Lake District National Park. Trail guides are available at the National Park Centers and bike hire can be arranged through the Coniston center. Windermere Lake Cruises - The company operates a fleet of 16 vessels including restored Victorian Steamers, capable of carrying more than 500 passengers and small vintage motor launches available for private hire. They operate year round with sailings from several different departure points on Windermere. Ullswater Steamers - This company has five historic vessels. They operate year round and it is possible to board and disembark at different stops, schedules permitting. The Steam Yacht Gondola on Coniston Water is a restored steam yacht operated by the National Trust. It is on the water from March 24 to October 31 and trips must be booked in advance. Check the schedule and prices. The Lakes are linked to quite a few English literary figures with attractions linked to them that can be visited. William Wordsworth was born in Cockermouth, just outside the national park. Wordsworth's childhood home and garden are now owned by the National Trust and are arranged so that visitors can see how the family lived. Dove Cottage, in Grasmere, is where he wrote some of his greatest work and is open to the public through the Wordsworth Trust. And if you are in the Lakes in the early spring, March and April, look for the fields of wild daffodils dancing in the wind around Ullswater. They are the ones that inspired Wordsworth's most popular poem, "I wandered lonely as a cloud", usually just referred to as Daffodils. According to the Wordsworth Trust, it is the most popular poem in the English language. Popular children's author, Beatrix Potter, fell in love with the Lake District and was instrumental in preserving many of the traditional farming methods and breeds of sheep. She lived and worked around Windermere. You can visit Hill Top, where many of her stories were written and see her original artwork at the Beatrix Potter Gallery, in a 17th century house maintained by the National Trust. Another children's author, Arthur Ransome, based his children's adventure story, Swallows and Amazons on an island is Coniston Water. If you take a boat out on the lake you can try to guess which island is was. Or you can visit the Ruskin Museum, in Coniston, to see the sailing dinghy Mavis - complete with centerboard - that inspired the story. Summers are crowded in the Lake District. There are few roads and those are narrow and wind through valleys and mountain passes so traffic can be a real problem during July and August. Go, if you can, in spring or autumn, when the color of the landscape is at its best. Winter also has its charms - there is little snow, except on the highest ground and the lakes don't usually freeze. Steamers on Lake Windermere and Ullswater cruise all year round. Keep in mind though that winter fell walking is only for well equipped walkers with plenty of experience. Some of the higher road passes can ice up in winter.